One of the great things about Great Britain is of course Ordnance Survey, our 225 year old national mapping agency. Since a lot of their data was made open in the last decade it has become easier than ever to explore and map the country (particularly if you're some kind of GIS boffin). I should point out before going any further that Ordnance Survey covers Great Britain only, not Northern Ireland. For that, you'll need to look at Ordnance Survey Northern Ireland, who also have a good selection of open data. In the past, I've created sets of building data for English cities, done some calculations on how much land is taken up by golf courses, and a variety of other things, including creating 3D building models using OS open data. 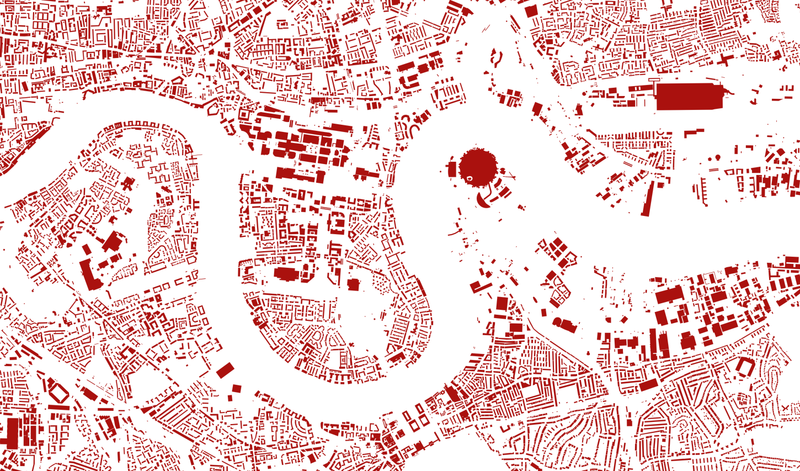 Today I'm sharing some shapefiles of all buildings in Great Britain. Why have I done this? The main reason is that I want to share these complete files with others who might need them and don't want to - or know how to - patch together separate tiles of Ordnance Survey open data. 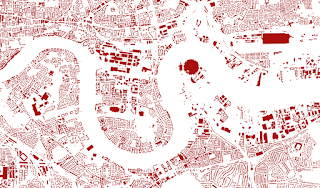 If you need some building footprint data, you can just download the set you need and zoom to your chosen area, or extract what you need from an individual shapefile. I used the OS OpenMap - Local product for this, so the detail in the buildings is very good, as you can see below in the zoomed-in extract. The reason I did this in the first place was because I wanted to come up with a number for the percentage of the land area of Great Britain that is covered by buildings. There has been some debate about this topic, and it was covered in an FT Fact Check piece in 2016 by Kate Allen partly in response to the claim that golf courses cover more land than housing. My calculations using new OS data revealed that Great Britain is 0.54% golf course (1,256 sq km, about the same area as Greater Manchester). But do buildings cover more than this? Yes they do. 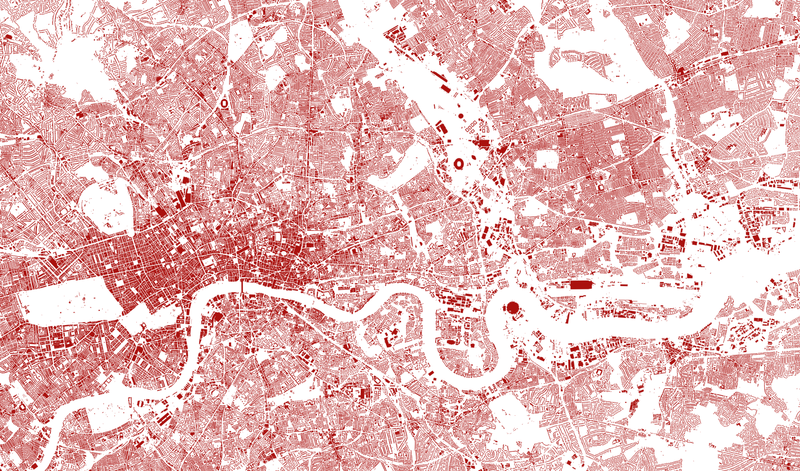 Using the data I'm sharing here, I calculated that buildings in the UK cover 1.35% of the land. I reported this previously in a tweet that was quite widely shared. To my embarrassment, for the GB figure I used the UK area as the denominator so the figure reported there was a little low, though the England, Scotland and Wales figures were and are accurate. Here's the important information you need, if you're ever faced with an awkward silence at a party. The Great Britain figure equates to about twice the area covered by Greater London - 3,150 sq km. 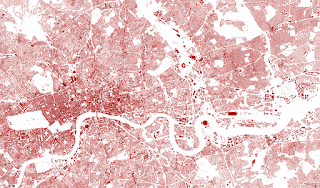 However, the OS OpenMap - Local product isn't the most detailed building-level data covering Great Britain. For that, you'd need to look at OS MasterMap, a much bigger job. That is, unless you are Mike Gale and Tom Armitage at Edina and you have all this information in a lightning-fast database ready to query. They very kindly went beyond the call of duty and did some calculations and confirmed that my figures are pretty much spot on. They did loads of other really cool stuff too, but more on that another time perhaps. The complete set, and individual files, are pretty big, since they cover large areas and have millions of individual polygon features in them. This isn't exactly the best way to view and map this data, I know. That's obviously an understatement. 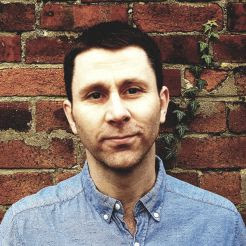 But I also know that it's the format many people know and love, and want to work with. So, if you want to play around with buildings or use this as background mapping, be my guest. Giant shapefiles make the world go round, okay. More seriously, there are better ways to download and view this data, but that's for another blog post. On a related note, see this from Emu Analytics on a very cool project which utilises OS building data. If you download the files and look at the attribute table in your GIS of choice, you'll see that I've added an area column for each polygon showing the area in square metres. Using this to query the dataset can be interesting - e.g. to find the largest building. Be aware, however, that the OS OpenMap - Local data still has a degree of generalisation in it so sometimes separate buildings can be merged together - e.g. if they are very close together. But I know from what Mike and Tom did with MasterMap data that this doesn't affect the final calculation much at all, thankfully. As for the golf courses vs. housing thing, I know that's not strictly-speaking solved definitively either. The reason for this is that we have no way of knowing exactly what area houses cover vs non-residential buildings. As far as I know, even Ordnance Survey don't know this, and probably can't know this from what data we have available to us. However, the vast majority of buildings are residential (not sure on the %) and I'm very confident that housing covers a much bigger area than golf courses, I just can't say how much.